The princess is sick! Oh no! There is a potion that can be brewed to heal her up, right as rain, but one of the ingredients, the Mandrago plant, is incredibly rare. It is up to the kingdom's healers to go out into the forest and find it. But the forest is full of hazards, so searching for the Mandrago is more than just looking for the right plant. Who will be the first to find the plant and save the princess? 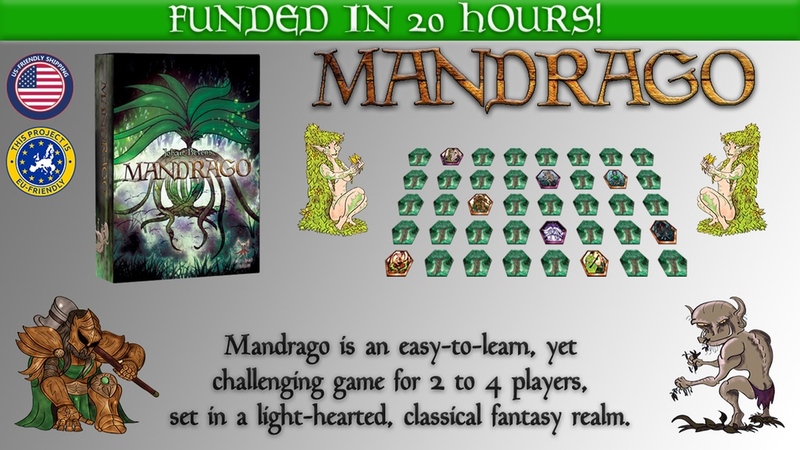 That's the story behind Mandrago, a new board game that's up on Kickstarter now. In the game, players are looking to score the most points. They do this by going around the face-down terrain tiles that make up the board. So you're never quite sure what part of the forest you'll be ending up in next. It's a bit of a memory game, as you show off tiles to other players, and then they go back face-down in the forest. Depending on what creatures are on the tiles you flip, you will get differing amounts of points. The Kickstarter campaign is already over their funding goal with still 22 days left to go.